First run with just the stroller/scooter girls. We've done this as a family, but the hubs was at work this time. 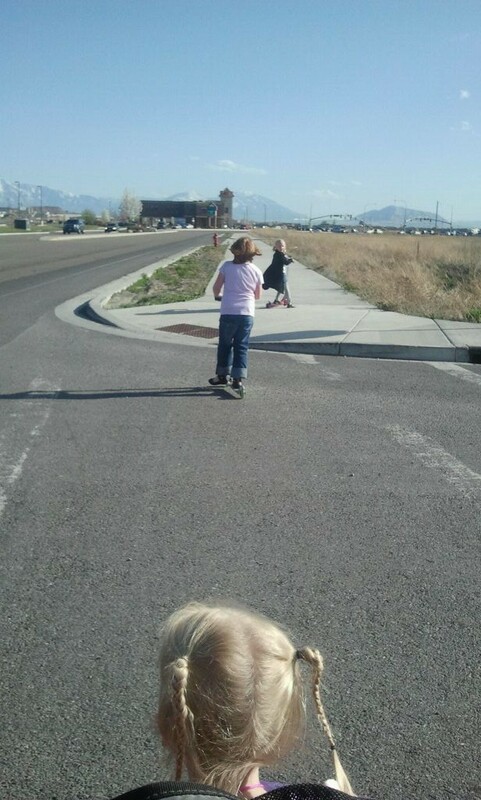 Our favorite little friend from next door came with us, and she's a newbie at the scooter runs, so we took it a little easy. I think our stroller/scooter girl runs will become a regular thing since The Princess is a speedy little thing and can go forever on her scooter. She's the perfect running partner to keep me moving, motivated and challenged! 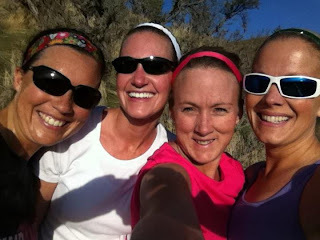 First trail run with some amazing gals. I ran my first real trail run on Tuesday evening, and I couldn't have had better company. I will say I'm not totally sold on trails, but it was fun. I just have a hard time seeing my pace at the end of the run. However, I can see how trail running would make me a stronger runner. So I might have to give it a few more tries before I come to a final verdict. I was really nervous about the run, and not just because it was my first trail. Janice finished a 50-mile ultra 10 days before this run (she's amazing), Frances runs trails like a pro and is the Active Bands queen, and Julia is kicking running's booty these days. So I was a little nervous. but for no reason. They are awesome!! 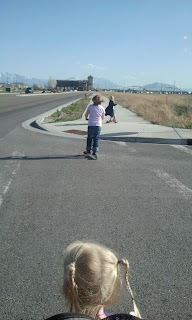 If I could run with these three every time, it would be a no-brainer. First week of half marathon training. Utah Valley Half Marathon is June 9th! I thought I was going to hate trail runs, but I'm starting to love them. Then again, I've only been on a couple. I'm glad you had fun on yours!! Yay!!!! So glad we met and went for a run. You are such a sweet heart. Let's run in July..... K? Aww look at all the cute Utah girls! So glad you enjoyed the trail run - it sounds like a fun time! I love my trail runs because I don't have to be speedy. Okay, I am not speedy so the trail makes me feel normal! How exciting a new training program! Good Luck! 1. What was the last thing you ate? A big dish of vegetables. 2. Where do you live? I live in Italy near Rome in a city named Civitavecchia (Old Town). 3. What is your guilty pleasure? Pizza and coca cola. 7. Morning person or night owl? Morning person. 8. What time do you get up in the morning? 06.35 a.m.
9. Baseball or football? Rugby!!!!!! 11. What do you want to find in your Easter basket? A different Italy with a different class of politicians. Great picture of the four of you! That a great picture - looks like you're having fun! Running trails can be rough at first, but we've all been there. We've faced harder challenges that this, right? Plus, with these three gorgeous women running with you, you have nothing to worry and you'll have more fun! Good luck on your half marathon training!